the city of Halifax, Nova Scotia. 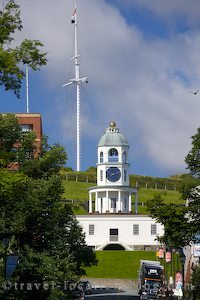 Our second visit into the city of Halifax consisted of a walking tour, which we highly recommend. We found the info centre in downtown Halifax, where they provided a city map and brochure explaining the different stops along the way. We took in the most usual sights such as the Naval Clock, which was fabricated in London in 1767 and now sits along the waterfront. Further along was the Maritime Museum of the Atlantic which houses a few remnants of the Titanic plucked from the sea by rescuers and taken home as souvenirs. They were later donated to the museum and preserved. There's an array of historic churches such as St Paul's built in 1750 (oldest building in Halifax), and the St Mary's Basilica - work began on that masterpiece in 1820. Historic buildings of varying types abound including the City Hall which is a fine example of Victorian architecture built in 1888. We headed back to the truck and got a little side tracked by a cute bikie labrador dog named Max, sitting on the back of his owners Harley. He was very photogenic! Soon our tummies were grumbling as we'd skipped breakfast to get into town early, so we honoured them by finding a Cora's. Cora's is a franchise restaurant which we first found in St John's in Newfoundland where they serve breakfast and lunch right through to 3:00pm. Bacon and eggs, french toast, pancakes, waffles, crepes, omelettes, all sorts of delicious treats are in store! Trouble was there was a waiting list for 30 minutes - so we put our name on the list and headed out to fill the time in photographing. The shops and cafes with their interesting signs make for great subjects as we strolled the streets before reaching the pretty Public Gardens which were opened to the public in 1875. After finally getting in for brunch - we headed back to the campsite via the Dartmouth waterfront.